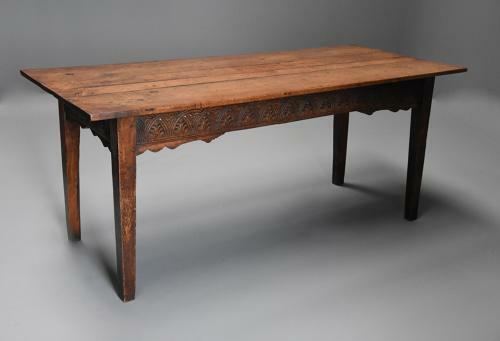 This table consists of a solid oak plank top of superb patina leading down to reclaimed mid 17th century (circa 1650) rails, three of the rails to the front and sides being carved with an arcade decoration making this table very versatile as it can be used as either a side table or dining table. This leads down to shaped corner brackets to each side and terminating with four tapered solid oak legs. This table can either be used as a dining table or side table, it is in excellent condition for age, is of stable construction and can go straight into a home.